Forget cheap chocolate and – dare you even bother – picture-only advent calendars, and give the whisky lover in your life a way to count down to Christmas that will make every day feel like the 25th. By Matt Evans. The holidays are a time for celebrations, family and weathering the cold with your favourite tipple. It’s part of the reason why boozy advent calendars have gone from relative obscurity to being many people’s preferred method of counting down December’s days to Christmas. Let’s face it: who wants cheap chocolate when you can have a dram a day? With a miniature behind every door, boozy advent calendars allow drinkers to sample their daily rewards at their own pace, or save the miniatures for a Christmas bash. There are wine calendars, cocktail calendars, gin, Tequila and mezcal all available, but whisky’s soaring popularity means there’s no shortage of advent calendars featuring your favourite spirit. The sheer variety of whiskies available allows for plenty of day-to-day variation, transforming your December into an exploration of taste. Here are seven whisky-themed advent calendars to suit a range of palates and budgets. Better decide on one fast – after all, it’s almost time to open that first window. 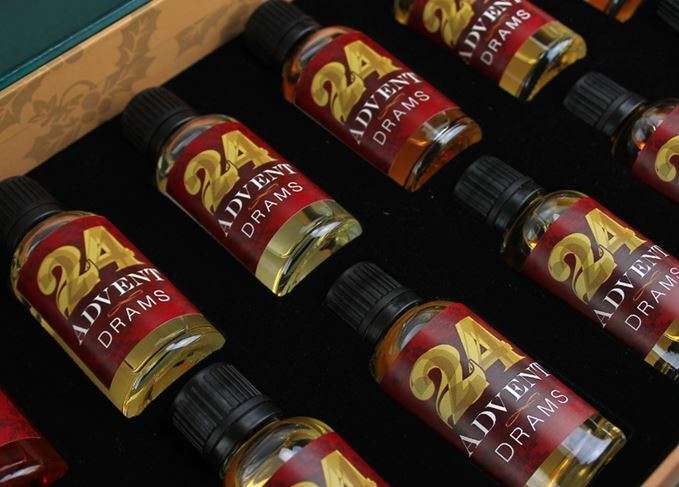 Inveraray’s Loch Fyne Whiskies has released a smartly presented package of 24 ‘advent drams’, although it is less of a calendar and more of a gift box full of mystery whiskies. Each of the 3cl drams are different and include world whiskies from Japan, America and Taiwan, alongside Scotch single malts plus Loch Fyne’s Living Cask Batch 4, its own solera-style bottling. There are no doors to open – instead, all the whiskies are labelled identically to retain an advent calendar’s sense of mystery. If you want to know what you’re tasting (who doesn’t), each whisky’s contents are detailed on the back label. Stirling-based glassmaker Angel’s Share offers a pair of calendars championing independent bottlers, both on the premium end of the pricing scale. Featuring miniatures from Wemyss Malts, A.D. Rattray, Samaroli, The Malt Whisky Co., Adelphi distillery and more, the 5th Standard Edition also comes with a glass, a lapel pin and a tasting notes booklet. If you really want to splash out this year, the £1,200 Collector’s Edition comes in an ornate rosewood cabinet with a glass, pin, booklet and a handcrafted whisky water dropper. The Famous Grouse advent calendar is a significantly cheaper option than the Angel’s Share Collector’s Edition, largely due to the fact it contains only a single miniature, which is unveiled on Christmas Eve. The remaining windows contain whisky-flavoured chocolate truffles made with the eponymous blend. At a scant £13, this may be the best calendar to get your whisky fix on a budget – although for the same price you could get a full-size bottle of Famous Grouse instead. As the name suggests, Debenhams’ offering contains only 12 days worth of whisky, rather than the requisite 24, but for those still looking to keep their holiday budgets tight, this is among the cheapest of the bunch. Those 12 days of Christmas are sure to fly by with drams from Ireland, the US and Scotland, with Bourbon, Scottish blends and single malts offering a variety of flavours. If the gift of a dram a day isn’t quite special enough, personalised gift website GettingPersonal.co.uk is on hand with a customisable whisky advent calendar. Unfortunately, you can’t cherry-pick the drams included in the calendar itself, but you can write a loved one’s name and have it printed on the calendar as part of a special message to the recipient. Use it to either declare your fondness for your partner or to mark the calendar as yours, so thirsty family members don’t try to pinch a dram. With its logo emblazoned on everything from mugs to motorbikes, Jack Daniel’s is one of the biggest-selling whiskey brands in the world. Therefore, it’s no surprise the Tennessee whiskey producer is in on the Christmas merchandising trend. The Jack Daniel’s Festive Whiskey Calendar contains 23 drams spanning the whole JD range, from its Tennessee Honey liqueur to its single cask offering, the Single Barrel Select. If you’re worried about being short-changed on the 24th door, the Christmas Eve window instead features a mystery ‘special gift’ instead of a regular dram, which we won’t spoil. Dominating the market with a plethora of alcohol advent calendars, Drinks By The Dram has a calendar for every taste. Its flagship Whisky Advent Calendar covers everything from peated and Sherried single malt Scotches, to a variety of world whiskies from France, Australia and Japan. If focusing on one style is your thing, Drinks By The Dram’s specialist calendars also focus on American whiskeys, Japanese, Bourbons, single casks and special collaborations with distilleries such as Glenfarclas. Prices range from £150 for a standard edition, through to £10,000 for the luxury Very Old & Rare edition, which contains whiskies worth over £19,000 for a full bottle. Got a loved one who isn’t a whisky fan? Calendars containing vodka, Tequila, gin and other spirits are also available. Bottoms up. Drinks by the Dram calendar contains 24 miniatures of some of the world’s most coveted whiskies. Are you a malt maniac or dram dunce? Put your brains to the test in our annual whisky quiz. Which whiskies to choose for Christmas Day? Out to impress the rellies, our Whisky Virgin ponders which drams to crack open for Christmas. Scotch whisky personalities share their memories of how whisky has come to shape their Christmas. Grab a mince pie and a dram, and test your whisky knowledge with our festive quiz.